KENNEDY SPACE CENTER, Fla. — One of many challenges of long-duration space travel is storing the necessary food and other supplies. Without a way to replenish supplies, a mission to Mars would have to be self-sustaining. One way of reducing the very large amount of food required for such a trip would be to grow some of that food on the way. It’s unlikely astronauts would raise their own cattle as a protein source. 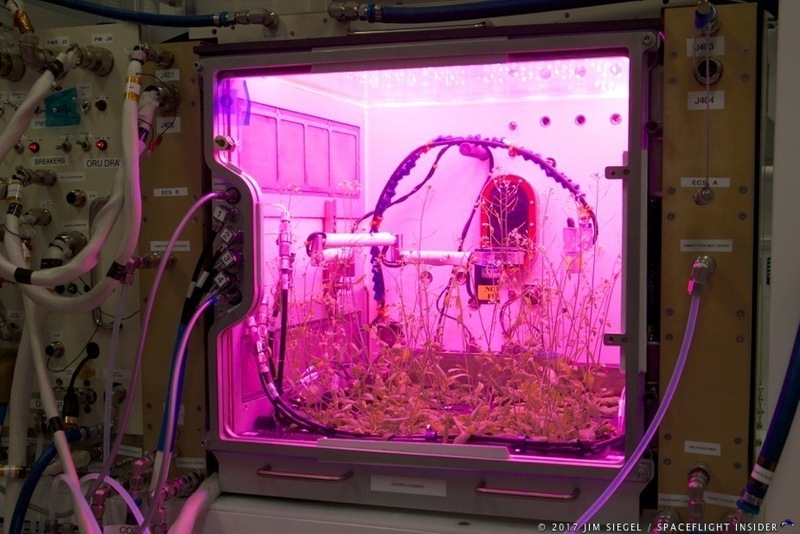 However, NASA has initiated several projects to study the possibility of growing plants in space, plants that would provide a portion of the proteins, nutrients, and carbohydrates needed by astronauts during a trip that would likely last for about two-and-a-half years. NASA’s latest food-related initiative was launched on April 18, 2017, aboard the Orbital ATK OA-7 mission to the International Space Station (ISS). That project, the Advanced Plant Habitat (APH), exceeds in size and scope what is called the “Veggie” project, NASA’s initial fresh-food growth system already aboard the ISS. According to Bryan Onate, NASA’s APH project manager, the new plant habitat is a fully enclosed, closed-loop system with an environmentally controlled growth chamber. It uses red, blue, and green LED lights as well as broad spectrum white LED lights. The system’s more than 180 sensors will relay real-time information back to the Exploration Research and Technology Directorate team at the Kennedy Space Center, including temperature, oxygen content, and moisture levels of the air and soil near the plant roots as well as at the stem and leaf level. Once aboard the ISS, the new habitat system will be activated by the astronauts but controlled by the team at Kennedy Space Center. The carefully controlled “NASA System” of lighting and humidity can often produce a crop yield in about a month – half or less of the time required in conventional farming on earth. The lighting operates on a cycle of 16 hours on and 8 hours off, to simulate the day-night cycle on Earth. An active watering system with sensors will detect when the plants need water and keep water flowing as needed. 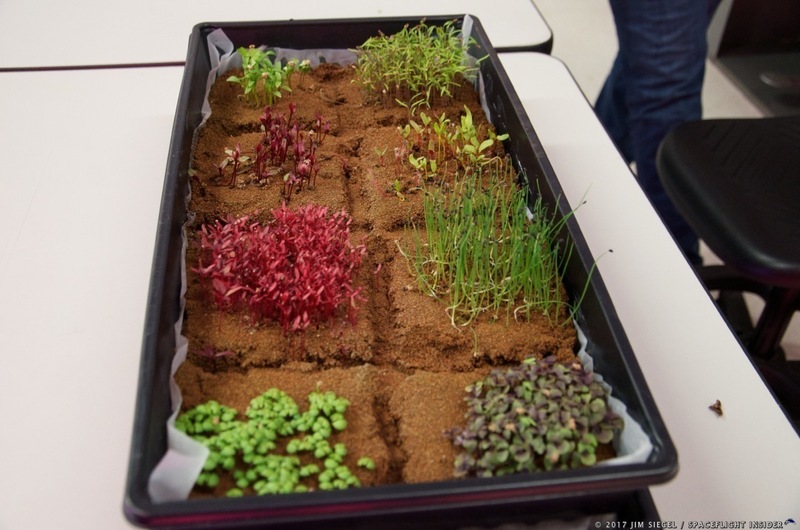 Plants will grow either using hydroponics or a kind of clay pebbles called Florikan that contain controlled release fertilizers. The initial crops will be Dwarf Wheat and Arabidopsis (often called rockcress) – small flowering plants related to cabbage and mustard. They are members of a food class called microgreens, a type of plants that are best known as an ingredient used in fine dining restaurants to add visual appeal as well as flavor. In recent years, researchers have discovered that these tiny plants also pack a much higher nutritional punch that their larger, more mature counterparts. Tara Ruttley, an ISS program scientist, said to not expect the space station astronauts to be consuming the resultant plants from APH anytime soon.